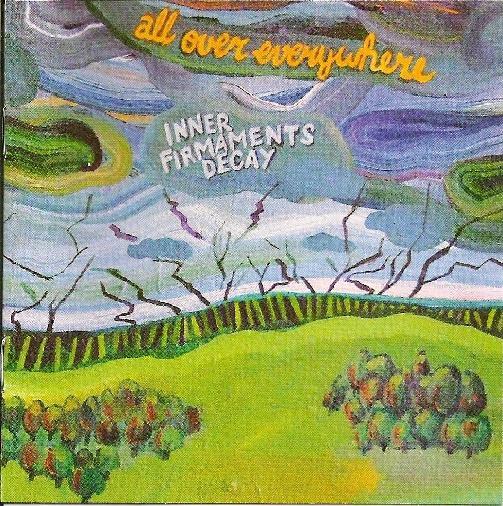 All Over Everywhere - "Inner Firmaments Decay"
I'm never going to listen to this album again. And it's quite possibly a very good album. Based on classic Progrock in the Camel/King Crimson tradition, though without the riffs or any sense of "rocking" per se... an almost-always lady-vocal present... the sound is ever lush with various keyboards (including mellotron), vibra/xylophone, oboe, flute, cello and more... a Brit-folk sensibility occasionally arises...there's a certain songwriting element of sorts, but it sounds like basically one song with variations and could have been strung together with segues under a single title/track. It's supposed to build to a crescendo but the sound is pretty much of a solemn or epic mood throughout. The actual finale is more intense, but only a touch. The vocal of "On a Dark Street" stands out a bit. Neither my body, mind nor combination thereof is tickled or stimulated by this album. Something's missing, or there's too much of something, or this type of composition doesn't hook me (or perhaps more practically stated: it's just not my cuppa). There may be a lot here for serious prog-heads to sink their teeth into, or they even might find it unmoving, I just can't say. If you're prone to processing lyrics, that could add something to the experience.